Sediment traps are containers that scientists place in the ocean to collect particles falling toward the seafloor. The traps collect tiny sediment or larger accumulations called “marine snow,” which is made of tiny bits of organic matter, dead sea creatures, tiny shells, dust and minerals. The sediment traps used on this cruise are clear plastic tubes, about two feet high and four inches across. Analyzing the samples helps scientists understand how fast nutrients and trace elements such as carbon, nitrogen, phosphorus, calcium, silicon and uranium move from the ocean surface to the deep ocean. These materials are the only food for almost all deep-sea life (since sunlight doesn’t reach the deep sea, and plants can’t grow in the dark). Some sediment traps will be deployed just under the ice, to see what nutrients are falling out of the ice toward the seafloor. The scientists will drill a hole in the ice, hang the trap under the ice, then leave it for four to six hours. When they come back, specks of material will be suspended in the water. They’ll pour the water into a bottle and take it back to the ship for processing. Other sediment traps will be deployed on a cable hanging from a float. 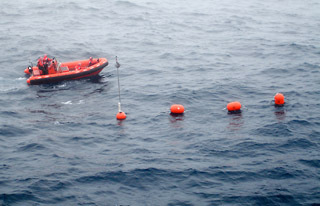 The traps are attached to the float at varying depths, from 25 to 100 meters. Each set of traps is left to drift and collect sediment for 24 hours.